With Madoka Kaname's sacrifice, the hopeless cycle that once bound every magical girl to a terrible fate was broken at last. Still, the magical girls fight on against the dark magics that threaten the human world, which remains ignorant of the brave girl who saved them. Only Homura remembers her dear friend Madoka, a burden she has borne in all her battles since-right? Then how is Homura still going to school with Madoka, fighting alongside her, laughing as if nothing has happened? As her tragic memories return to her, Homura realizes she must not be in the real world, wonderful as it is to see her friend again. But if she is indeed trapped in a magical space, who among her magical friends could be the cause? 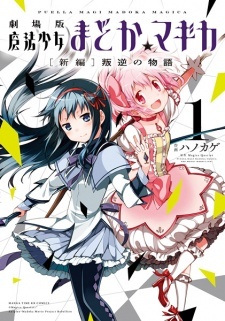 Gekijouban Mahou Shoujo Madoka★Magica: Shinpen - Hangyaku no Monogatari was published in English as Puella Magi Madoka Magica: The Movie -Rebellion- by Yen Press from December 15, 2015 to February 23, 2016. As a sequel, but also as an adaption of the animated feature, Rebellion is a strange project to critique in that it's already a very understood story due to many rewatches of the film. That said, there are still points that I find bogus, unnecessarily complex, and unfortunately barren within the Rebellion narrative, both the film or the manga. The first third of Rebellion is fairly good. It's a mystery that treats it's reader as intelligent, never revealing the mysterious nature of the work until a specific point, that point transitioning into the second third. While the first third properly lays a foundation for the second and third parts, the second is when things begin to pick up and you, as the reader, start learning things about this new world our favorite Magical Girls have been cast into. However, as things transition into the final part, everything seems to fall apart. Certain lines imply certain things that people should already understand, while other lines seem completely incorrect to the established lore. There's an entire conversation that's left to conjecture and poorly translates any intended reasoning for its inclusion in the story, and there's another that has a line which climax's with more confusion than clarification. Many may be reading this and going, "Well, Paraturtle, you're just an idiot!" Perhaps, but when your first story, Madoka Magica, is unbelievably clear and clearly states everything from beginning to end, it seems out of character for a narrative to pursue an open-ended way of storytelling, especially when you read the final chapter. And, even in that final chapter, very little is explained, unlike the final chapter of the previous story arc of Madoka Magica. This, most likely, is due to preference, but I find that the open-ended nature is nothing more than a recognition of the mere market value that Madoka Magica has earned over so many years. Rather than tell a complete story and tie a bow, this one tells an obscure origin story and leaves a teaser. This isn't necessarily offensive, but, as someone who loves a contained narrative, I find this to be incredibly irritating. On the lighter side, but still negative, the story itself is ridiculously contained. Like the original story, we don't learn much beyond characters, even less so in this story. You may be wondering, "Paraturtle, why did you rate the artwork so low? 6/10? Bogus!" Let me clarify: If you hadn't seen the film, so much of this doesn't make any sense! For instance, there's a fight scene that is virtually shot for shot of an event within the film. It takes place in the second volume and at one point I went, "Alright, had I not seen the film, what is taking place on this page?" And I stared at it for a good long minute before I realized I had no idea what was happening. I even flipped through it again just to follow how things panned out and it was still a blunder. It looks great, but I have no idea what's taking place. For instance, Homura uses time stopping, but how the heck do I know what that effect is on a 2-dimensional PAGE! This is the fault of the medium, not the artist, I will concede. However, the previous arc was drawn by the same artist and instead of going shot-for-shot with their artwork, many things were drawn with an original eye. Only 2 scenes I can recall in Rebellion's manga took a different art style than the animated film. And, to roll with that thought further, the entire manga is straight up, artistically, the film on page. No bonus points for originality. This is pretty dang bad. I think there's a lot that could have been done here to tell a different, but similar story in the form of setting. However, someone decided it was better to play things safe. To discuss this section in great detail would require spoilers. I don't work with spoilers, so I'll try to be as concise as I can. Rather than create realistic characters in unrealistic situations (a la Madoka Magica), this narrative is unrealistic idealistic character personifications in unrealistic and fantastical situations (Rebellion). This transition is pretentious, borderline offensive and abusive to an already excellent and well-established cast, and just straight up dumb. When someone has a formula that works - better yet, a formula that is perfect - I think they have to be insane in the brain to think it's a good idea to mess with it. That's exactly what happened in Rebellion, and the work itself is the aftermath of someone getting far too ahead of themselves. For instance, what made Madoka Magica great was how it subtly implemented failed idealogies into each character. These idealogies define them but upon finding out that they weren't satisfactory, crumbled and suffered the Witch's curse. However, their idealogies never got in the way of their general character. Yes, they defined them, but no, they weren't JUST the idealogy. It's that distinctive trait that caused their fall to be so petrifying, saddening, and downright dreadful. Now, in Rebellion, the characters are one-dimensional, banking on your understanding from the previous arc, and forcing them into idealogically characterization and nothing else. There's very little characterization other than Homura's character, and even then she really isn't being defined, just being the protagonist because she's the only one who sort of knows what's happening. It's... weird. I say weird because, to someone who is going in blind, really will see it working. I mean, it DOES work. I think the characters work out well, at least, well enough to tell the story. However, the problem is that Madoka Magica had characters coming in and out. Rebellion has an ensemble cast being juggled in a short amount of time. There isn't enough time to be shared among characters. There doesn't have to be, to some degree, as you will find upon reading this story, but it's evident that there wasn't enough space to work with the amount of characters. Fairly enjoyable. I'm rather callous to this narrative since I've seen the film so many times. Unlike the first arc's manga, I didn't, however, feel as invested or affected by the story. Each time I've experienced the Madoka Magica story, be it show or manga, I was always moved by the events of the story. However, Rebellion is a different story, one that doesn't have it's predecessors charm or pizazz, to put it strangely. It's nothing special, and tries really hard to be. I suppose what I'm saying is that it's decent enough but not nearly as enjoyable having seen the film, which is definitely the preferred medium to experience this story. This story is very visual, audible, and should be experienced in motion, not on a page. That said, read it anyway. It's short and explains some stuff better than the film does. Also, some panels look great. From the cute to the scary. From playthings to serious display figures. From affordable to requiring you take out a second mortgage. Here are 15 dolls from various series any anime fan would love.